As many of you already know, my 3 boys and I went on a trip to New York City this month. I’ll admit, I was super nervous to not only be in the Big Apple with my young, active boys, but it was also winter so I had no idea what we could do! Luckily, there were many fun things to do with kids in NYC in winter – here’s some of the favorites we were able to fit in during our short stay! Yes, this is the same trip, thanks to Swiffer, where I met Sarah Michelle Gellar. Thank heavens they also let me bring along my sister Skye – there’s no way I could’ve done all these fun things with the kiddos by myself! We had roughly 3 days there, and filled them to the brim. I will say this – my poor boys’ feet were killing them by the end, so prepare them for lots of walking. Our first night, we decided to beat the NYC winter cold by grabbing some delish hot cocoa (and yummy food) at Max Brenner Chocolate Bar restaurant. It’s my new favorite – and they even had really fun items and presentation for the kids! There’s no shortage of museums in NYC, but we chose to visit the Museum of Natural History because of the dinosaurs and animal exhibits. Right when you enter the museum you’re welcomed by tall skeletons of dinos, making it super easy to get the boys excited. They also have rotating/temporary exhibits, and when we went one option was a butterfly walk-through! We were there for several hours, but didn’t make it to every floor – there’s so much to see! If you can make it to Time Square, I recommend hitting up M&M World – it’s THREE FLOORS of fun stuff! We even got to meet ‘Mr. Blue’, send Grandpa a photo of a firefighter M&M, and the boys rocked out to the music for a LONG while. I admit, I could’ve spent a FORTUNE in this store – especially with their extensive line of Star Wars things! I let the boys each pick something – we got an Orange M&M hat, Miss Green (because he loves green) and Mr. Blue stuffed M&MS. Also in Time Square is Hershey’s Chocolate World – but I admit it was a major disappointment after the M&M place. One floor, several fun items to buy but not really anything interactive like the other place. As we were leaving I noticed a back area where you could fill a bucket with your choice mix of favorite Hershey’s treats – which would be a great souvenir! We did grab a ‘make your own chocolate bar’ kit from there and made those at the hotel after dinner, which was fun. I highly recommend doing the Time Square stuff during the day with kids because 1. it’s lighter so you can see them better, 2. it’s less crowded and 3. it’s probably less scary during daylight. Plus fun photos! During our Swiffer event, we got to hang out with Cricket, founder of The Creative Kitchen – she was such a blast with the kids! She said they have parties, events and other things often, so check their website to see if there’s anything going on while you’re there. We chose to also do the 4-D movie with Scrat form Ice Age. It snows, you get a tiny bit sprayed on, and the kids laughed the whole time. There’s also a ‘children’s area’ of the zoo where things are up close and personal for them. There’s a space for them to climb on a ‘spider web’, climb in turtle ‘shells’ and even feed goats. Perfect for getting their wiggles out! Another great thing about Central Park Zoo is the beautiful scenery – there’s still green around! We got some fantastic photos – thanks Skye! 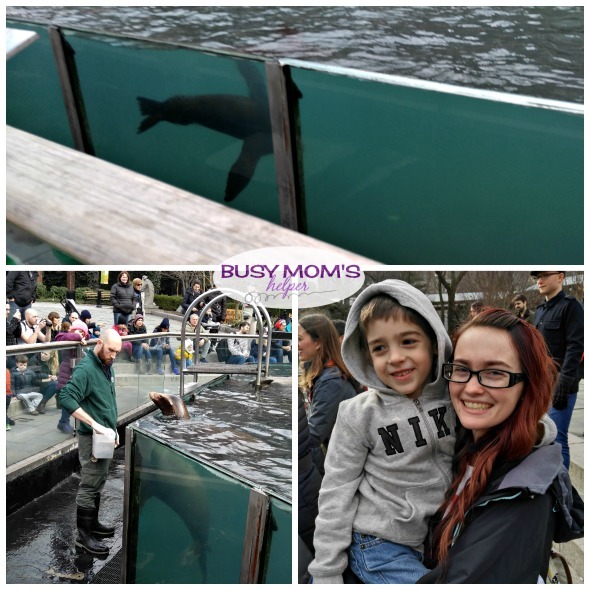 The entire zoo day was fabulous – but the absolute CAN NOT MISS part was the Sea Lion show! The trainers interact, train and inspect their 2 sea lions, and you’re right there close to the edge so even the little kids don’t miss anything. The kids couldn’t get enough of the tricks and sounds of these adorable sea lions. They wouldn’t leave the zoo at the end of the day without telling them ‘goodbye’! Travelling anywhere with kids can be a nightmare if they’re hungry – so be sure to swing by for lunch or a snack at the Dancing Crane Cafe. Prices weren’t outrageous – about $8 for a kids meal and $8-$13 for an adult meal. Skye and I grabbed their ‘season cups’. It cost a tiny bit more than a large drink, and you get free refills in them the whole day! I couldn’t get enough of my cute boys! Another fun building at the zoo is the bird house – you go in WITH the birds! They’re flying and walking around, so you can get right up close. At first the boys weren’t sure what to think, then they thought it was awesome. Just be warned – there’s birds above and around you – you might get pooped on. We didn’t, thank goodness, but I was worried! Again, the children’s area was perfect for letting the kids work out some energy (and warm up their little bodies in the winter cold)! Since we had a bit of time before heading to the airport Friday morning, we took the subway to Dylan’s Candy Bar for some last minute fun and shopping. It kept the kids from driving us crazy at the hotel until we left! Both floors of this candy store were full of treats and fun candy-themed products. The giant lollipop tree was a great welcome as you came in. Even the lit-up stairs were decorated with candies! You know my love of chocolate – so I had a hard time not buying a ridiculous amount of stuff here! But I couldn’t say no to a couple of their special candy bars….I even got a White Chocolate one for Nerd Dad (hubby)! There’s plenty of New York themed items to nab as a souvenir for someone back home, too – and again, the Star Wars section caught our attention! Not really interactive things like M&M World, but still lots to look at and the kids really enjoyed it. We had a FANTASTIC time in New York City! Although I’m not sure I’d take my kids there just for a random vacation until they’re older (mostly because of the subway and walking stress) but we did have a really fun time, and it’s great to know there’s so many things for kids to do in NYC during winter! Disneyland Just for Kids? Think Again! 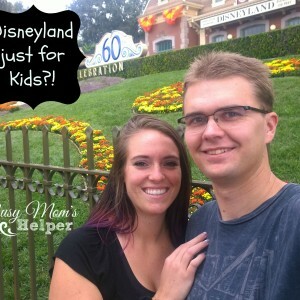 Is Disneyland just for kids? You may have heard that all around, but think again! Is Disneyland just a vacation spot to take kids? My husband and I had the great opportunity of visiting Disneyland and California Adventures in October and we think it was the best vacation we have taken in the four years of being married. So think again if you think Disneyland is just for kids. We absolutely loved this vacation because there was so much we could do but also nothing we had to do. The rides we went on, the treats, shows, characters all of it was exciting and fun and brought us closer as a couple while we enjoyed each other’s company through the parks. What can you do there that is so amazing? Some rides may not be as enjoyable if you are prone to motion sickness like the Californian Screamin’.It is a very fast paced and intense roller coaster with many drops and a big loop-de-loop that gives you and upside down view of Paradise Pier. If you like more mellow rides try Peter Pan, Splash Mountain, Snow White, or Pirates of the Caribbean. One of my personal favorites is Toy Story’s Midway Mania which is a 3-D style arcade shooter game breaking plates and popping balloons. My husband and I have competitions on Midway Mania to see who will win and the winner either picks the next ride or the loser has to buy treats. Yes I ended up losing quite a few of the games but it was worth the fun we had together. If you’re looking for some tips or pointers to make your trip more enjoyable try getting fast passes for rides with long lines, download mouse waits or the Disneyland app to check wait times and hit the ones with shorter wait times. No fast pass and you really want to go on it? Find some games on your phone to play together or get a hidden mickey book. Hidden Mickeys are all over both of the parks! In several stores there is a book you can get that goes through all of the hidden Mickey’s throughout the parks. Some are difficult to spot and some are so easy you’ll wonder why you didn’t see it before. This is great while you’re waiting in line. Check the book and get ready to see the Mickey’s in the lines and on the rides. The book isn’t very expensive and we found that it was less expensive in the park rather than online at Amazon or Ebay. Another fun activity to do is trying to collect the parks souvenir pressed pennies. I included the paper that my husband and I followed showed us where they were all located. While we looked for the machines, we went into shops and locations that we never knew existed. At several of the shops there were souvenir books to keep all your pressed coins nice and neat. It was about $9 and again don’t buy it online were we found them for $30! So don’t waste your money and just wait until you get to the park. Food! Ok who doesn’t love food? Well for those of you that aren’t rich (like us) here are some tips on not breaking the bank on food. First, bring a bag with a water bottle that you can keep filling at water fountains throughout the day. Second, don’t be afraid of leaving the park to get food. Just outside of Disneyland in a very short walking distance there are several restaurants that will fill you up and not empty your wallet. We ate at Denny’s multiple times during our stay. We loved how we could sit down, relax in a cool place on a hot day and order some really great food and not stress about the bill. The service we got there was great and we ended up eating just two main meals and little snacks in between rides that we took into the park ourselves. Now that I said leave the park for food, there are a few things that are worth the little extra money because the memories you and your partner will get from them are priceless. Turkey legs! Yes I am serious, a huge turkey leg. Now these are a little expensive so we shared one together, trust me they’re massive and one can easily feed two people. So grab one, get a bench and attempt to eat somewhat politely a turkey leg. My husband and I were a mess after but it was so fun eating it, oh and don’t use a fork, have some fun just eating it without utensils. Churros are another great treat you should get at least once. We stayed late in the parks several of the nights we were there, a Churro made a perfect late night snack. Another fun treat to get right before the night time shows are ice cream sundaes. There are several ice cream stores that offer a variety of Disney themed novelties. My favorite was a Mickey Mouse shaped sundae that we got at one of the several carts throughout the parks. Character dining is a great way to meet Disney’s beloved characters instead of waiting in often long lines to meet your favorite characters. This provides great entertainment and great food for all meals of the day. Both Story tellers Café and Goofy’s Kitchen offer a buffet and a meet-n-greet where the characters walk around and come say hi. The nightly entertainment with parades, shows, firework are often crowed but are they worth it? Absolutely! I love my husband so much and us being there and watching incredible shows was magical. The Paint the night parade followed by the Disneyland Forever fireworks was my absolute favorite thing we did. By far the best parade and fireworks we have ever seen. The fireworks were breathtaking over the incredible castle and made for a perfect night to spend with my best friend. World of Color is also another very cool show that had images projected on water, with fire, music, and lots color. The light up Mickey Mouse ears actually sync with the show to give it a little more added color. The Mad T Party was another show that involved a live band, dancers, and performers the played a variety of well-known songs. Disneyland is one of my favorite places to go and all the memories and amazing times we had was magical and will live with us forever. So grab your partner and head to Disneyland because it’s not just for kids it is for anyone and everyone of all ages. Head over to Get Away Today and reserve your magical vacation for just $125! Use Promo Code: BusyMomsHelper for $10 off your package! I’m already missing our fantastic trip to California last month, and wishing we were to the point of planning another – like NOW! So much fun was had, and a large part of why was Our Disneyland Rental House. Plenty of space for 19 people, lots for the kids AND adults to do, conveniences like washing machines and extra towels, plus a huge resort pool made this a truly magical vacation! Now, Dea (the owner) has FANTASTIC photos of the house right here on the booking site – much better than my own photos! I wanted to really show it from my own personal experience, though, so am only using my own pics. Seriously, if you’re planning a Disney vacation, or just any Anahiem-area trip you will LOVE this home! Let’s start by looking at the bedrooms – there are EIGHT! Here’s the Cars room, with 5 twin mattresses, plenty of toys, it’s own TV and a little Mater play area. You can also follow the listing link to see available dates, and see the nightly rate for the dates you’re considering going. Again, please excuse the mess because we were on VACATION, meaning we let the kids play more than clean sometimes! There’s also a Princess-themed room that are girls truly enjoyed, also with 5 twin mattresses…. Those are both upstairs, along with this master bedroom that hubby and I slept in. It wasn’t huge, but the bed was plenty and the closet was just what we needed. No TV in this one, which I didn’t mind in the least. One of my sisters, being 19 and not married, was thrilled she got a room for herself – and it wasn’t all ‘kiddie’! (not that she’d mind, of course). No TV, but a really fun Hollywood theme for her! The other ‘adult’ room upstairs is HUGE, with it’s own en-suite bathroom and open area with sofa. This was perfect for my adopted sis and her hubby, along with their two in playards/cribs. There’s a hall bathroom upstairs, as well – pretty basic, and I will say the shower head was super low making it a bit ‘eh’, but completely fine overall with plenty of cabinet space, and a stool for the kiddos. Here’s the view from inside the front door AND top of the stairs looking to the front door – so you get an idea of the layout a little, and see the nice open foyer. Downstairs there’s 2 more bedrooms – this one does not have a bathroom en-suite…. There’s also a hall bathroom downstairs, but I didn’t get a picture – sorry! When you first walk in the front door, to the right is a media room that houses plenty of sofa space, a lounge chair PLUS a daybed (so could be used as a bedroom – just no ‘closing doors’). The video selection was excellent, plus games and gaming systems! To the LEFT just inside the front door is the garage – which has been turned into an awesome game room with Foosball table, pool table, and couches. Since it came out the day before our trip, we HAD to have an Age of Ultron family movie night! Luckily straight inside the front door is the giant family room, with a huge and VERY comfy sofa, table, and even more chairs with rolling ottomans! Lots of quality time was spent here – as well as working time! The kitchen wasn’t enormous, but plenty big for a few of us to maneuver around cooking meals. The dining room table could fit the vast majority of us (we had 19, if you include the babies) and highchairs. They also have a computer with internet (and wireless), as well as a printer. They make sure that the 2 linen closets are fully stocked with towels (downstairs) and linens (upstairs). Plenty for everyone! And we had no problem doing laundry with the TWO sets of washer and dryers! Now, how dare I mention a RESORT STYLE POOL without lots of pictures, right? I got a few when we weren’t using it…. …but you really can’t tell the size without people actually inside so…. The lazy river has plenty of room to float around in, and they have water shoes you can wear to protect your feet. There’s also LOTS of water toys and floaties! The floatie jacket/life vest type things you see our younger kids wearing in the pictures were ones WE brought, though, not provided by the house. See, it’s HUGE! We spent many, many hours in there – even took a day off of Disneyland/Legoland so we could fit in plenty of pool time. The kids were on the slide constantly, and the adults enjoyed it just as much as the kids! There’s also a nice hot tub to the side, which was great for evening relaxing. I love that the pool area was safely fenced off, especially since we had SO MANY kids with us! There’s a nice little table/seating area just outside the kitchen (fenced off from the pool, so no worries about the kids) and an adorable playhouse! I don’t know how I didn’t get pics of that – but go look at Dea’s on the site. The neighborhood is very quiet, with nighttime ordinances, so don’t plan to go here and make lots of noise at night! We easily parked our 4 vehicles out front (including our Kia Sedona we got to try out!). We all loved the decorative touches, like the fabulous chandelier in the foyer that I wish I could find somewhere! Dea, the house owner, was fabulous with responding to questions or concerns we had. She even set out the CUTEST welcoming gift for our family! The kids are already asking to go back to this house on our next trip! The girls had plenty of room to do their homework while in their princess room. We added our own ‘fun’ while we were there – creating these cute door markers for the bedroom doors! Yes, we’re a tad dorky, but we love it! So here’s what you need to do now – go HERE and reserve your dates for this truly amazing house, then head to Get Away Today to set up your magical Disney (or Legoland, or Sea World – whatever!) vacation! Use Promo Code: BustMomsHelper for $10 off your vacation package. You’ll love it – just like we did!!! Thanks so much to Dea for the fantastic vacation we had – can’t wait to stay here again! I received a Kia Sedona to use for about a week to facilitate this review. All opinions are mine alone. I love our current van, I really do – we’ve had it for 6 years now and it’s been fantastic. I even told hubby I didn’t care to ever switch until we absolutely had to because I was perfectly happy with it. After we tried out this other one on our recent vacation, though, there’s so many reasons Why I Want a Kia Sedona instead! I’ll be honest – the first day I absolutely hated it! I wasn’t use to the many features, since the van I’m use to doesn’t really have ANYTHING special (as I now realize). After I got use to what different things were for, I realized how great it was to have all the bells and whistles! First of all, there’s the dash system – here’s a shot of the navigation/map along with the SiriusXM radio. You can adjust the layout and view on here, this is what we liked best. See the purple arrow there? It’s pointing to a spot where it will show you the speed limit of the road you’re on! LOVED THAT! It doesn’t show here because, obviously, I was parked in a driveway – no pictures while driving, of course! I especially miss having the speed limit and map feature after our current move to a new area – it would help a ton as I’m getting use to the roads and what their speed limits are! When you put it in reverse, your dash screen looks like this…. ….with the great cameras showing your surroundings! This was especially helpful in parking lots, or the Disney parking garage with lots of vehicles and people! 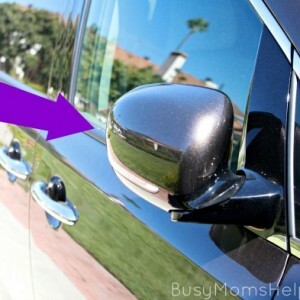 Another thing I found really helpful and important were these spots on the side view mirrors…. …that little area where you see the vehicles, it lights up if someone is coming on the side of you. Perfect for avoiding going into a lane that’s already occupied! It also clearly lets you know which doors are still open…. Some other good things are the easily accessible (and multiple) USB ports and such. The ones I clearly saw were, as follows in the photo….top: head of front console, middle: inside the roll-out center of front console and bottom: rear of front console for the middle row to access. There’s also the built-in window screens, which were a huge hit with our kiddos – especially since it was in the 90s and 100s during our trip! Don’t forget cup holders, of course – they seemed just big enough for most sizes, and not TOO big that things would tip and spill – at least not easily. As for space – plenty of leg room, and it’s all adjustable forward-back which makes it perfect for different family sizes and ages. The head rests were really adjustable, too, which made it nice as we were driving a lot – and made it more comfortable when they’d fall asleep in the van driving back to our house rental after a long day at Disneyland. Honestly, once we got use to the features (because at first they drove me nutty) there’s only really one thing I really didn’t like – okay, I hated – about the Kia Sedona……the tiny gap between the middle seats! It was such a tight fit – and I’m not a very wide person. My 19-year-old sister road in the back seat with the kids a lot during the trip, and she’s TINY! Yet she had a hard time fitting through this small spot. But honestly – that’s about the ONLY drawback to this van, so I call it a WIN! The kids all really loved it, too – so even though we do like our own van, we’re talking about switching sooner rather than ‘when we absolutely have to’, and the Kia Sedona is at the top of our list right now! The holiday season is coming up fast. Chances are that your family will be traveling to visit extended family sometime in November of December. Traveling with kids can be stressful, but planning can make all the difference. These 10 tips for holiday travel with kids are practical and simple. Hello Busy Mom’s Helper readers! 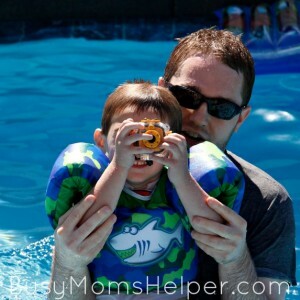 It’s Keri from One Mama’s Daily Drama and today I want to share some really simple travel tips. My in-laws live about 300 miles from my home and it usually takes us about 5 or 6 hours along winding rural roads to get to their house. Although we don’t travel as much now that my kids are older (ironically), when they were babies and toddlers, we made that drive almost every month. How did I keep from going crazy? I made a few small plans that had a big effect. I want to share them with you so that when you are traveling with the kids for Thanksgiving or Christmas (or any time, really), it can be pleasant for everyone involved no matter how far you are going. Plan for stops on the road. Kids have tiny bladders and the rocking of the car doesn’t help. Expect to stop every hour or two (depending on how old your kids are) for a bathroom break. If you check the route ahead of time, you can plan to stop at the cleanest rest stops instead of funky gas stations. Consider your child’s nap schedule. The rocking of the vehicle can lull a cranky baby to sleep. If possible, plan to drive during nap time. This way, when you arrive at grandma’s house, baby will be ready to wake up and play and hopefully her sleep schedule won’t be off too much. Make lists and delegate responsibilities. If you are not an uber-organized person, keeping track of everything you need for the trip can be a chore. Make a list for each person’s suitcase and let the kids pack themselves if they are old enough. You’ll also want a list of gifts, car essentials, and a few emergency items. When kids (and adults) get bored, they also get hungry. Pack easy travel friendly snacks that don’t need refrigeration, like granola bars, pretzels, and dried fruit. Fun car activities don’t have to be expensive – or even cost. Before each trip, I print off several free coloring pages and puzzles. What makes them interesting is that they are new. Borrow an audio book from the library. Christmas carols on a CD will get old pretty quick. Instead, pick up an audio book from your local library for free. Find something that will be interesting to kids and adults. We like classics like Charlie and the Chocolate Factory and the Bunnicula series. If you give the kids all of the snacks and entertainment at the beginning of the trip, they will be bored in 20 minutes. Instead, make sticky notes with times on them and stick them near the clock. When each special moment arrives, hand out a new coloring page or snack. Give your child a map. Nobody wants to think about the dangers of traveling, but it’s important to be prepared. If it will be cold, make sure you have the essential emergency supplies. Check the air in the tires and pack a spare. Let others know when to expect you so that if you are very late, they can take appropriate action. Sometimes this is easier said than done. It’s important to remember the reason for your trip: to visit loved ones. The holidays are a joyful time when we get to visit the people we love and don’t see as often. If you need to make a few extra stops, they will understand if you arrive a little late. If you forget to pack something, you can almost always find an alternative. 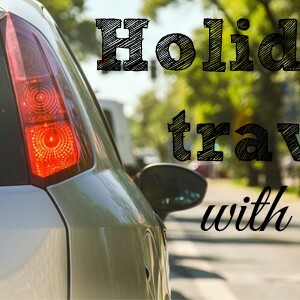 Which one of these tips for holiday travel with kids do you think would help your family? I’ve heard of a lot of people that have trips coming up – it’s getting into the slower seasons at major theme parks, so it’s the perfect time to go! Whether you’re planning a visit to Universal next week or next year, get your kiddos prepared with these Universal Studios Florida Printable Height Requirements! Before we went on our first-ever visit to Universal last month, I made sure to look up the height requirements. Knowing ahead of time what each of them could and couldn’t ride saved a lot of fits and meltdowns! I still suggest using your own judgement – even if a child IS tall enough to ride, doesn’t mean it’s best for them. For example, Black Widow would’ve been ‘fine’ going on Revenge of the Mummy, but she would’ve been terrified! You can download and print either a full-page 8.5×11 height requirement sheets – one for Universal Studios park and one for Islands of Adventure park – or a sheet with BOTH parks lists fit onto the 8.5×11 page. Several of the larger rides, such as Harry Potter and the Escape from Gringotts, have ‘test’ seats outside the ride so you can see if it will fit safely and comfortably. If you’re not sure, try them out! I personally LOVED Escape from Gringotts – the kids’ favorite was Flight of the Hippogriff over in Islands of Adventure. We went on that coaster more than any other ride! 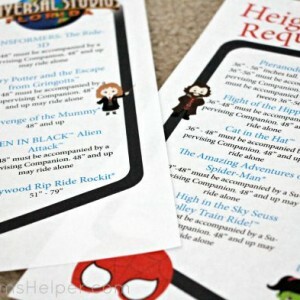 So get your plans all set for your next vacation to Universal Studios, print off these height requirements, and have a fabulous time! 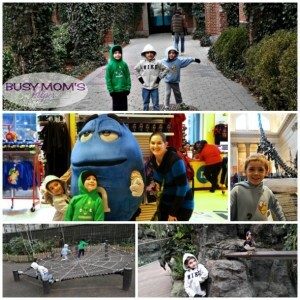 Book through Get Away Today for the best deals – and use Promo Code: BusyMomsHelper for $10 off your package! Heading to Disneyland instead of Universal Florida? We’ve got Height Requirements for there, too! The kids and I recently went on a trip to visit our families in Utah, and although the flight was making the travel part much easier, I was worried about the kids. It’s not a horribly long flight, except we did have TWO due to a plane change in the middle. That long sitting still in a plane doesn’t do well for these littles! Luckily I brought along a ‘secret weapon’ so I could have Happy Kids on an Airplane Without Electronics! If you know us, you know we absolutely love LEGO® – hubby grew up all about building and creating with them, and still has totes of them that we love to play with as a family. 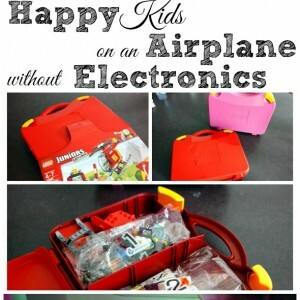 I love the imagination it brings out in my kids – but I never considered taking them on a flight before, at least until I heard about LEGO® JUNIORS Suitcases! Each of these come in a neat little suitcase (easily carried by the kids, which means less in YOUR hands) and inside are packed sets and simple-to-follow instructions. My boys needed just a tiny bit of guidance as we put them together – but Black Widow did just perfect by herself! Once we got the sets built, they didn’t need any help at all playing and using their imagination with their new pieces! They were really excited about the little people that came in each set (2 sets per suitcase, if you were wondering). They were happy to use their creativity to come up with fun stories, games and their own little worlds the entire flight – making it a much nicer trip for everyone! I always feel better when they’re using creative thinking skills and building confidence in themselves WHILE having a great time. LEGO® JUNIORS is designed to give children age 4-7 a great first building experience with the LEGO brick through iconic, fun and easy to build models. And it doesn’t have to be ‘pink for girls’ and ‘rescue planes’ for boys – they love them ALL! If you’ve got an upcoming trip – whether it’s on an airplane, car or boat – don’t leave home without it! The LEGO® JUNIORS Suitcase is the perfect travel companion to keep your youngster entertained this summer. Filled with an assortment of LEGO bricks and exciting role play components the suitcase is extremely portable— opening up a world of play possibilities anywhere you go! Where would YOU like to take these fun LEGO® JUNIORS Suitcases this summer?